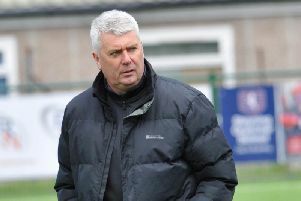 Adam Hinshelwood is wasting no time as Worthing Football Club look to assemble a squad that can challenge for Bostik League Premier Division promotion next season. Over the past week, Hinshelwood has managed to secure the services of 11 players from last term. Defenders Alfie Young, Joel Colbran and Matt Boiling will be back at Woodside Road for the 2018/19 campaign, as will Alex Parsons, Ross Edwards, Jared Rance, Kieron Pamment, Reuben Schneider, Joseph Clarke, Jesse Starkey and Rhyle Ovenden. Along with the players who have committed for next season already, Hinshelwood is set to sit down for discussions with Ben Pope, George Barker, Sam Rents and Harvey Sparks. Reece Meekums, a Worthing loanee for the majority of last season, was released by Brighton & Hove Albion on Monday, while goalkeeper Lucas Covolan and Aaran Racine are seeking trials at National League level clubs. But with the previous campaign coming to a close less than a month ago, Hinshelwood has been happy with his work so far. He said: “We’re in a position where if the season was to start tomorrow, we’ve got a decent-looking squad this early in the close season. “I’ve still got to sit down with a few of the squad from last season and I’ve had face-to-face talks with others I’d like to bring in as well. A couple of potential recruits who could interest Hinshelwood are former Bognor player James Crane and Havant & Waterloville striker Jason Prior, the latter having just played a major part in helping the Hawks reach the National League. Crane has left Rocks and is available, while there has been speculation about Prior wanting a move away from Havant. Hinshelwood added: “They are both players that I have great admiration for. “What team, particularly at this level, would not want Jason Prior leading their line? He’s a player that would demand finances that we probably could not offer. Versatile Meekums played a major role in helping Worthing avoid Bostik League Premier Division relegation last term. Following his release from Albion, Hinshelwood has been in touch. He added: “I have spoken to Reece (Meekums) after his release, it’s a tough blow for him but I just told him to keep believing in himself. n Worthing have frozen season-ticket prices for the third consecutive campaign. Adult tickets for the season will be £180, while concessions are £90.